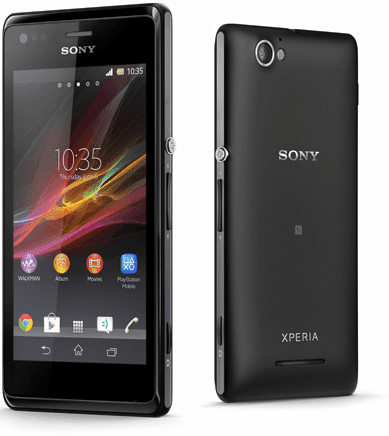 Sony Xperia M is a very popular mobile phone till now because of it's features and price. We all love Sony and knows that Sony's products are trustable and better than other manufacturers in terms of specifications and the hardware they use. If we compare any Micromax/Karbonn/Lava Quad-Core device with Sony's Quad-Core, then Sony will win because of it's hardware acceleartion. Indian manufacturers uses poor hardware which is very cheap and affordable. That's the reason why Indian devices are more affordable than Sony/HTC/Samsung even when its a Quad-Core device. Sony uses premium hardware, good RAM, good processor and not SoCs. Sony Xperia M was released in June, 2013 and we think it has some outdated specifications, but the development support of this device is very good. It has a 4 inch capacitive touch screen with 245 PPI pixels density and a 480 x 800 pixels resolution. You get 1 GB of RAM in this device which I think is not bad for a device which is launched in mid of 2013 at low price. Also, the processor is nice. It has Qualcomm Snapdragon S4 Plus MSM8227 Dual-core 1 GHz Krait CPU which is nice and can be compared with Cortex A9. GPU is also good. The mobile phone has Adreno 305, which can be again, compared with some good GPUs. Other specifications are also decent, but I am now going to show you how to root Soiny Xperia M.
Sony Xperia M with 70% battery charged. A simple application which is available in the Downloads section. USB Debugging enabled: Open settings application. Scroll to the bottom and select About phone. Open it and tap 7 times on Build number. After you will tap 7 times on the build number, you will see You are a developer now! message. Then see the rest of guide. Your device may freeze for some seconds seconds while performing this guide, so don't be panic. Nothing else, except some basic knowledge of using and installing applications on android mobile phones. Framaroot Application. Use only the application which has Gandalf exploit. Get Framaroot from it's official thread on XDA: Click HERE (Download Framaroot 1.5.3 application). Download the application from your PC. Enable USB Debugging in your device (how to do so given in the Prerequists). If you have installed an appliaction from SD Card, then install it, and if you are installing it for the first time then see it how to do so: Tap on the application. You will see a popup which will warn you to install the application or not. Just select Yes and it will take you to another menu where you will see some options Enable install applications from unknown sources option. Click on Open the application and select Superuser. Now select SuperSU from the drop-down list. Click on Gandalf exploit to root your Sony Xperia M.
You will see a message Success ...:-) Superuser and su binary installed. You have to reboot your device in the popup which means you are rooted now. Reboot your device to root it. You can try downloading Root Checker application to confirm that you are rooted or not. Feel free to comment here, in this blog.